The "Blonde Brownie" or commonly know as "a blondie" is my all time favorite! By definition these are a rich, sweet dessert bar made from flour, brown sugar, butter, eggs, baking powder, and vanilla, and may also contain walnuts or pecans. 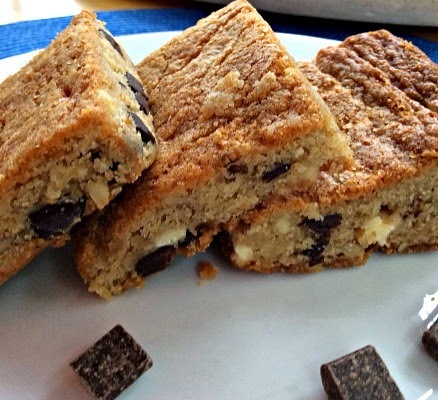 Chocolate chip blondies may also contain white or dark chocolate chips. My recipe for the "Blondie Bar" is a healthier version of that described above and as always is gluten, soy and dairy free! This is truly a winning recipe! Preheat the oven to 350 degrees. Lightly grease a 9x13 baking pan. In the bowl using either a handheld or standing mixer, cream together the coconut oil and sugars. Add the eggs and vanilla and mix on high until light and fluffy, about 3 minutes. Add the almond flour, baking powder, and salt. Mix to fully combine. Fold in the chocolate chips and walnuts. Spread the dough into the greased baking dish. Smooth into an even layer. Bake for 25 minutes, or until golden. Allow to cool for 15 minutes. Slice into bars. I love the combination of the almond flour with the walnuts, what a fabulous recipe! I pinned these. They look so good!! 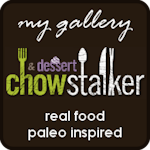 Another fan favorite on AFW this week! Great job! Excellent! I just made these and they turned out great! Thanks! I made these for my IC diet and they are wonderful.